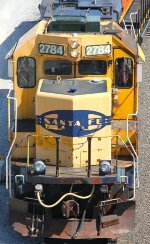 Description: A pair of BNSF geeps switch out Argentine Yard. Title: BNSF 1768 and alot of other Power sit at Argentine. Description: Power mix at the BNSF shop's. Description: The four units headed up by BSR 715 in the ATSF warbonnet paint passes by BNSF 2784 & BNSF 2815 who are just getting ready to start up. See another album for those two. Description: With the crew arrival, things will be starting up soon for this pair in the BNSF Argentine Yard. Description: The engineer gets the proceed signal from the conductor. Description: With a puff of smoke, the two locos head west with their short string. Description: As the cab approaches the South 42nd Street overpass, we can see the two crew members in their seats. Two seconds after this was snapped, they waved good bye. Title: With one more puff of smoke . . . Description: Like an Alco of old, BNSF 2784 chugs out the smoke as it rolls under the South 42nd Street overpass. Doesn't sound like an growling Alco though!